Even as new agricultural technologies develop, food insecurity remains a grave problem throughout many parts of the world. 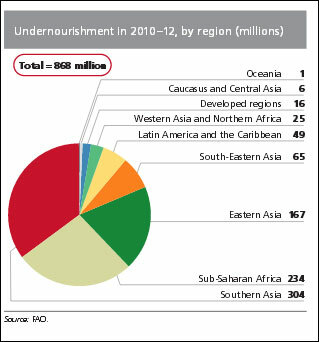 According to the U.N. Food and Agriculture Organization (FAO), 12.5% of the global population is undernourished. The U.S. Department of Agriculture estimates that even in the United States, 21% of households with children are food insecure. Food for 9 Billion, a joint news reporting initiative started in 2011 by the Center for Investigative Reporting, PBS, and Homelands Productions, highlights many of the myriad challenges that have resulted from rising international food prices and other barriers to food security. Some evidence suggests that the relationship between violence and food insecurity is mutually reinforcing: In a 2012 study, “Conflict, Food Price Shocks, and Food Insecurity: The Experience of Afghan Households”, the researchers find evidence that households in provinces with higher levels of conflict suffer greater declines in food security than households in other provinces. But are rising global prices of all types of commodities always associated with conflict? Looking primarily at oil and coffee — Colombia’s two largest exports — the authors can determine that when the price of a labor-intensive agricultural commodity (coffee) rises, work hours and wages go up and conflict declines in the areas that produce the good. In contrast, when the price of less labor-intensive natural resources (oil) goes up, conflict also goes up in the areas that produce more of these resources. The authors note that several policy implications follow from these findings. They suggest that “price stabilization schemes which place a floor on the price of labor intensive commodities can help mitigate violence in the wake of price shocks.” They also suggest that governments should work to closely monitor funds generated by the country’s natural resources and, if necessary, reform fiscal structures in order to prevent these funds from fueling violent activity. Citation: Dube, Oeindrila; Vargas, Juan F. “Commodity Price Shocks and Civil Conflict: Evidence from Colombia,” The Review of Economic Studies, March 2013, 1-38. doi:10.1093/restud/rdt009.